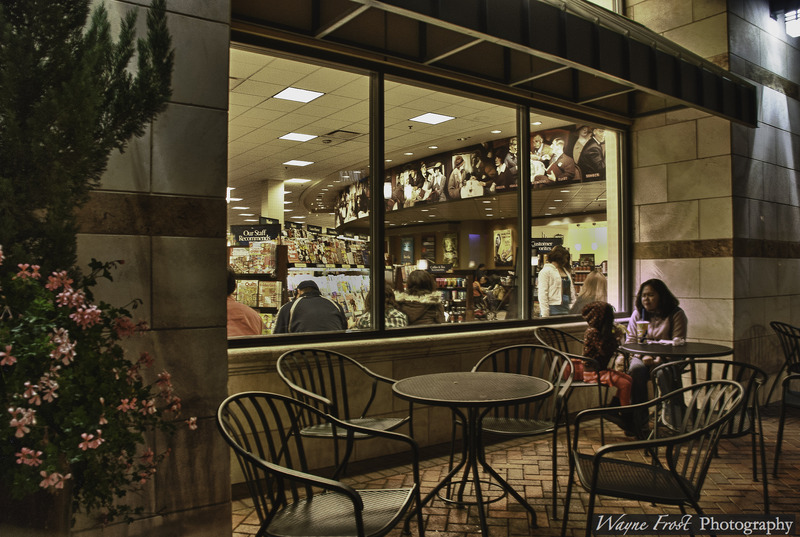 The weather in Southern California has been unusually cool recently and when we came upon Starbucks last Saturday evening every available seat inside was taken up with bodies staying nice and toasty. The temperature outside was probably in the low forties or high thirties when this image was captured, making the very hot, large non-fat mocha latte that Judy brought out to me that much better. The exposures were 1/20, 1/6 and .7 second, using the monopod. A couple of hot spots were dodged, and one area was cooled down using Control Points in HDR Efex Pro and Nik Sharpener Pro 3 was used for final sharpening. This entry was posted on December 2, 2010 by Wayne Frost. It was filed under HDR, Night Scene, Photography, Street Life and was tagged with bookstore, coffee, cold, HDR, hot, night, photography, Starbucks, window.